(19687.TO.A097.10.1.3, Chester R. Cowen Collection, OHS). 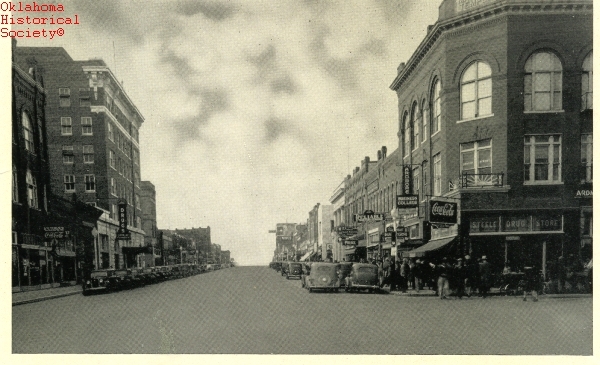 Incorporated in 1899, the south-central Oklahoma community of Ardmore is situated just east of Interstate 35 on U.S. Highway 77, ninety-seven miles south of Oklahoma City. It serves as the county seat for Carter County and was established in 1887 in the former Chickasaw Nation, Indian Territory when the tracks of the Atchison, Topeka and Santa Fe Railway were laid across the Roff Brothers' Seven Hundred Ranch. From a cattle-loading station, the town became a trading center for farmers and ranchers and a market for cotton. In 1913 the discovery of the Healdton Field brought growth to the city. The town is named for Ardmore, Pennsylvania, which sits along the Pennsylvania Railroad. A Santa Fe crew foreman, previously been employed by the Pennsylvania Railroad, suggested the name. The Ardmore post office opened in October 1887. Located between the Arbuckle Mountains on the north and the Red River on the south, Ardmore flourished to twenty-five hundred residents by 1890, and in 1895 more than ten thousand bales of cotton were marketed there. When a fire started in a livery stable in 1895, nearly every wooden building in town burned. Bricks and stone were then applied to the rebuilding of the community. In 1903 a grant was received for the establishment of the Ardmore Carnegie Library (NR 00000620), which is one of seventeen Ardmore properties presently listed in the National Register of Historic Places. Others include the Carter County Courthouse (NR 85000678), completed in 1910, and the Ardmore Historic Commercial District (NR 83002080). Beginning in 1906 Ardmore's streets were paved and an interurban system was installed. In 1908 local agricultural resources remained dominant with cotton being primary, but attention was being turned to the mineral deposits surrounding the town. That same year Ardmore had thirty-one factories, 130 retail stores, seven banks, and nineteen churches. The Oklahoma Confederate Veterans Home was located there from 1911 until 1942. Two years after the Healdton Field was discovered, disaster struck on September 27, 1915, when a gasoline tank car exploded in the Ardmore railroad yard. Most of the downtown area was demolished, forty-three people died, and hundreds were injured. As a result of the oil boom, Ardmore became a refinery center. Samuel Lloyd Noble, a local oilman and philanthropist, used his wealth to establish the Samuel Roberts Noble Foundation at Ardmore in 1945. The Akron Tire and Rubber Company maintained an Ardmore plant from 1915 until the 1920s. In 1942 the Ardmore Air Force Base was activated. Located about twelve miles northeast of town near Gene Autry, the facility became the Ardmore Municipal Airport in 1959 and is home to the present Ardmore Industrial Airpark. In 1967 the city's largest firm was the General Dynamics subsidiary plant, Stromberg-Carlson, whose products included aircraft equipment and various cable and printed circuit board assemblies. In 1990 Michelin North America purchased Ardmore's Uniroyal-Goodrich Tire Plant, which had originated as a Uniroyal facility in 1970. It remained the community's largest employer into the twenty-first century. Among recreation and cultural amenities within and near the city are numerous parks, as well as Lake Jean Neustadt, City Lake, and Mountain Lake. The Charles B. Goddard Arts Center for the Visual and Performing Arts, established in 1970, is a major regional institution offering Western and contemporary art exhibits from its large permanent collection. Local museums include the Greater Southwest Historical Museum and the Eliza Cruce Hall Doll Museum, which is located inside the Ardmore Public Library. Named for a widely known performer and horseman, Hardy Murphy Coliseum is a regional venue for rodeos and horse shows. Florence Hughes Fenton Randolph, rodeo saddle-bronc rider and trick rider and 1927 All-Around Champion, lived in Ardmore and was inducted into the Rodeo Hall of Fame at the National Cowboy and Western Heritage Museum. Ardmore is administered by a home rule charter form of government. The community's population steadily increased from 5,681 in 1900 to a peak figure of 24,283 in 2010. The community had 14,181 residents in 1920, 16,886 in 1940, 20,184 in 1960, 23,689 in 1980, and 23,711 in 2000. The Daily Ardmoreite has kept locals informed since 1893. Other community newspapers included the Indian Territory Sun, the Ardmore Daily Press, and the Ardmore Democrat. "Ardmore," Vertical File, Research Division, Oklahoma Historical Society, Oklahoma City. Daily Ardmoreite (Ardmore, Oklahoma), 22 February 1987. Mac McGalliard, "Pioneer Spirit: The Centennial History of Ardmore," The Chronicles of Oklahoma 65 (Spring 1987). W. A. McGalliard, "Ardmore 75th Anniversary," Oklahoma Today 12 (Autumn 1962). Julia K. Sparger, "Young Ardmore," The Chronicles of Oklahoma 43 (Winter 1965–66). Maxine Bamburg, "Ardmore," The Encyclopedia of Oklahoma History and Culture, https://www.okhistory.org/publications/enc/entry.php?entry=AR008.